Tags Posts tagged with "Dog Loss Poems"
Have you lost a pet and are looking for something to comfort you? Do you know someone grieving the loss of their pet and want to offer support and condolences? 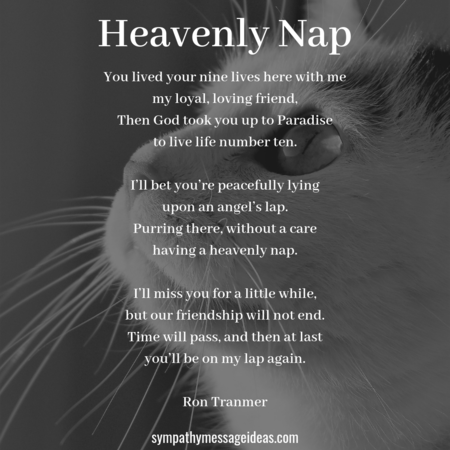 One of the best ways is with pet loss poems. They can communicate feelings and emotions in a far greater way than our own words. So have a look through our range of pet loss poems below. The loss of a pet can be such a difficult time. They so often become one the most important things in our lives – members of the family, there to comfort us at our lowest points, the source of such happiness. So when we lose them it’s just awful. Nothing to can prepare you for that loss. And very little can help to comfort or console you as you grieve. But we still try. We reach out to others who have lost a pet. We want to comfort them. Mainly because we know what they’re going through. But how do we show we understand and offer that sympathy for their loss? 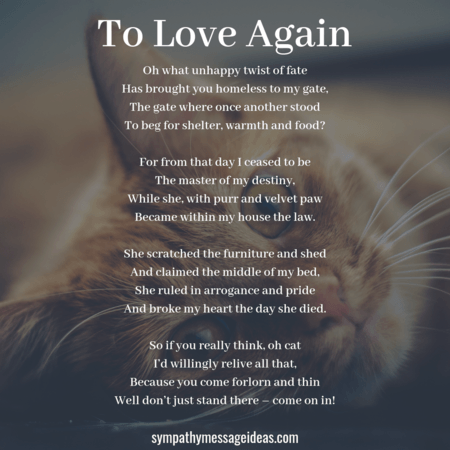 A great way is with a pet loss poem. Poems go beyond a simple message and express the feelings we may be struggling to articulate ourselves. They can be touching, heartfelt, stir emotions or work as a way to come to terms with the loss. 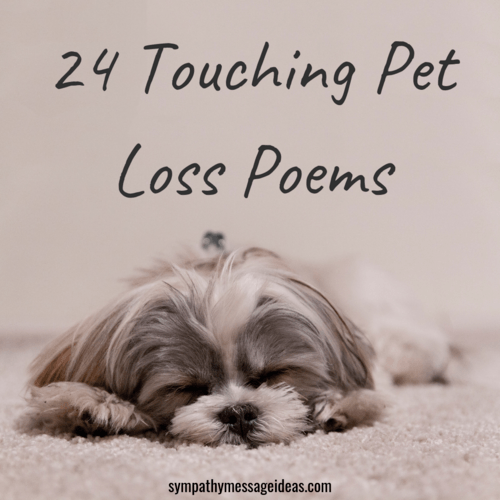 So if you or someone you know is grieving the passing of a beloved animal friend then a pet loss poem may help to deal with that grief and bring a small amount of comfort amongst the pain. 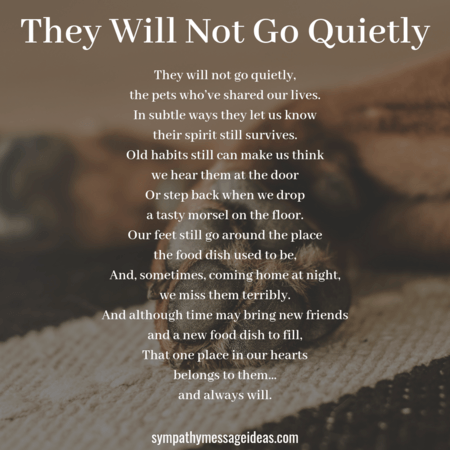 These are some short and simple pet loss poems. They are perfect for including in a sympathy card or note, perhaps with a gift. You could also put these on something like a fridge magnet or framed with a photo of your lost pet to remember them. the time will come when we must part. a sparrow with a broken wing. the love I gave you lingers on. grieve not, I am in a better place. These are much longer and more in depth poems. They can be used for memorial and funeral readings. 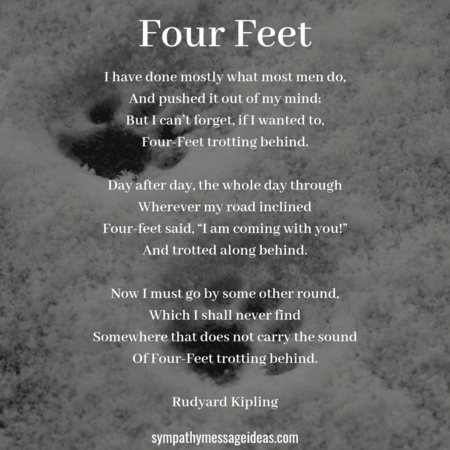 unto a spot on the floor…. then I remember it can’t be yours…. Be patient, live your journey out . then come home to be with me. … And within your heart I long to stay. Just look for me, friend, I’m every place! The poems above were more general in their tone and aimed at the loss of a non specific pet. The poems below are all for dogs and reflect why they’re called a mans best friend. his head within our hand in his old way. You simply just wait for your life to restart. You’ll ever recover from pain you feel now. But time is a blessing and memories are gold. One day you’ll see her and love her again. Cats are just as popular as dogs and losing one just as painful. These poems look at the impact our feline friends have on our lives and how we miss them. the cats who’ve shared our lives. 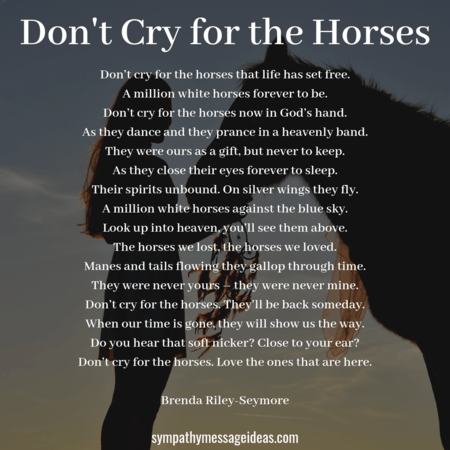 Don’t cry for the horses that life has set free. Don’t cry for the horses now in God’s hand. Look up into heaven, you’ll see them above. They were never yours – they were never mine. Don’t cry for the horses. They’ll be back someday. Don’t cry for the horses. Love the ones that are here. Wake up Mum, wake up quick! I have to stop your nightmares or you’ll get sick. Instead I’m just in spirit; I’m now an invisible bun. The best a bunny could have. And I nuzzle you with pride. The special one to me. You see, I can still see you, although you can’t see me?